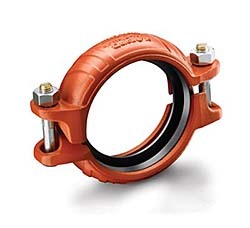 The Style 107 QuickVic® rigid couplings are available in sizes 2-12 inches wide, and the couplings are designed to connect standard roll-grooved and cut-grooved steel pipe. The couplings accommodate pressures ranging from full vacuum up to 750 pounds per square inch, depending on pipe diameter and wall thickness. The couplings are supplied with a grade EHP ethylene propylene dimonomer gasket, which features a temperature range of -30-250 degrees. Grade T nitrile gaskets also available.